Everything you need to know about the Middle Tennessee Blue Raiders as they begin the NCAA tournament. The Case For: The Blue Raiders are on a roll, having won six straight games after last Saturday’s clutch 55–53 victory over Old Dominion in the Conference USA tournament title game. Middle Tennessee loss just five games in conference play and earned the C-USA’s No. 2 seed in its tournament. The key for coach Kermit Davis is a capable defense, which ranks 71st nationally in adjusted efficiency. Upshaw and senior forward Perin Buford form a formidable front line, one that gives up offensive rebounds on just 25.5% of opponents’ opportunities (19th nationally). Middle Tennessee should also enter the NCAA tournament with a chip on its shoulder. While the program reached the Big Dance in 2013, this marks just its second trip to the tournament in the past 27 years. Plus, the Blue Raiders carry their first conference tournament title into the bracket for the first time since that 1989 season. But success is nothing new in Murfreesboro with Davis at the helm. The coach has won at least 24 games in four of his last five seasons, so don’t expect Middle Tennessee to fold against imposing competition. The Case Against: Middle Tennessee won the Conference USA tournament despite an inadequate offense. Its attack ranks 197th in adjusted offense, and finished just ninth in its league in scoring (72.7 points per game). 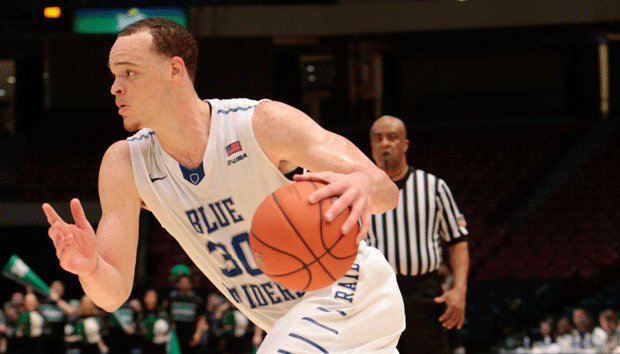 In the C-USA tournament title game, the Blue Raiders shot a dismal 36.5% from the field. And even though late free throws helped Middle Tennessee hold off Old Dominion, don’t count on this roster to ice games at the charity stripe: Its 60.7 free-throw percentage ranks 349th nationally. That offense is a big reason why Middle Tennessee has yet to prove it can beat tournament-caliber teams. The Blue Raiders’ best wins are two victories over Old Dominion, the 111th ranked program in the country. Davis and company otherwise dropped its only two games against top-100 opponents in losses to VCU and South Dakota State, both of whom have punched their tickets to the tournament. That résumé doesn’t bode well for bracket-busting.